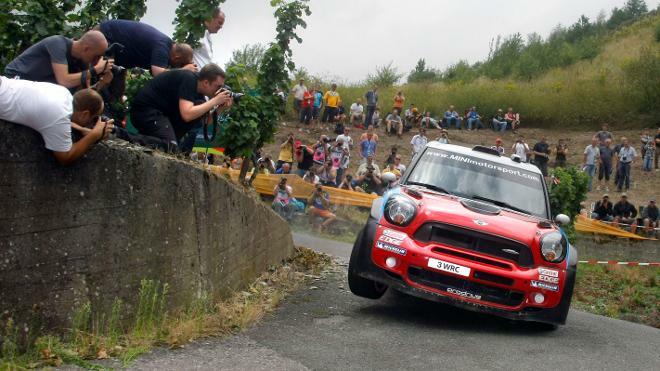 Terrific news out of Germany today where the MINI WRC team came in third, securing their first podium finish. 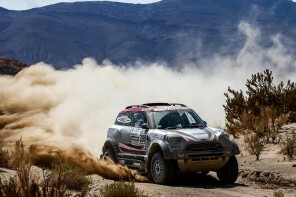 Dani and Carlos in MINI #37 fought off enough of the competition in the final stage to hold onto third overall. The other team car, piloted by Kris Meeke and co-driver Paul Nagle was sadly DNF due to mechanical issues. 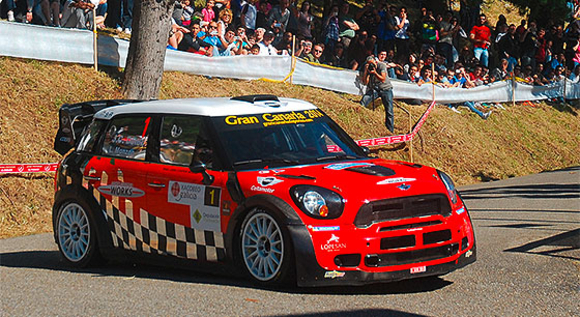 A huge congratulations to the MINI WRC team, with a stellar finish with so few races under their collective belts. It’s a huge achievement, and we’re sure, the first of many. More details after the jump. A podium position on the ADAC Rally Germany was the reward for the MINI WRC Team after Dani Sordo (ES) and Carlos del Barrio (ES) finished third in their number 37 MINI John Cooper Works WRC after a flawless drive. 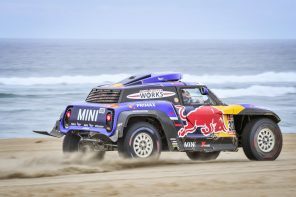 It also looked as if their team-mates, Kris Meeke (GB) and Paul Nagle (IR), were set to make it to the finish in Trier, but then on the penultimate stage an electrical gremlin struck and the car stopped while they were still fighting for fourth. Sordo had a rally long battle with the Ford of Mikko Hirvonen (FI) and after 19 stages and 359.59 kilometres of competition finished 48.1secs ahead of him. For Kris he started the final day in fourth ahead of Petter Solberg (NO) in his Citroen. Despite a rear puncture on the first stage of the day, Meeke only lost 1.1secs to Solberg. However, on the second one what Meeke described as an ‘optimistic’ pace note saw him have an excursion into the vineyards and drop to fifth. Despite this he started a fight back, but then when the car stopped on stage 18 the battle with Solberg was over. It was only 11 months ago on the 15th September that the MINI rally car first turned a wheel in testing in Portugal. In that time the team has competed on only three World Rally Championship events and made it to the podium on its first tarmac event. While this may be the team’s first podium, for the second time this season it has been awarded the Abu Dhabi Spirit of the Rally Award for Sordo’s great drive. Super Special Stage 19: They have finally done it: In 3:22.9 minutes Dani and Carlos set the fifth fastest Power Stage time, thus defending third place overall in their MINI John Cooper Works WRC number 37. The gap to fourth-placed Ford driver Mikko Hirvonen is 48.1 seconds. This means that the still young MINI WRC Team records its maiden FIA WRC podium in Germany! Happy faces all over the place, mechanics and engineers celebrate together with the many MINI fans. This success will give the squad an extra boost for the remaining three rallies this year. P3 in Germany – and this is just the beginning! Kris Meeke and his co-driver Paul Nagle are unable to join the action on the final stage after their mishap on SS18. Still Kris can be proud of his performance in the no. 52 MINI WRC, after holding fifth overall for many stages and matching the pace of the front-runners on more than one occasion. Special Stage 18: In spite of his comfortable lead of 31 seconds over Hirvonen, Dani shows no signs of playing it safe on this final stage on the outskirts of Trier before the spectacular Power Stage concludes Rally Germany. Third place overall is within eyeshot for Dani and Carlos now. Meanwhile Kris and Paul have to stop on stage which costs them sixth place..
Special Stage 17: After an early service break on Sunday morning Dani maintains the strong pace towards a podium position that he showed earlier in the day. In spite of heavy rain to start the stage Dani and Carlos go fast und extend their lead over their closest rival for third place Mikko Hirvonen by 5.2 seconds. Special Stage 16: “As long as I’m ahead of Mikko, everything is okay,” says Dani after SS16. 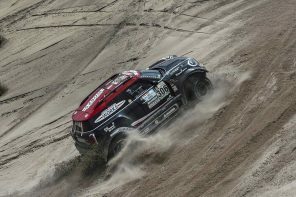 On soft tyres he and his co-driver Carlos del Barrio drop just 0.8 seconds to Mikko Hirvonen, successfully defending third with an advantage of 25.9 seconds over the current runner-up in the championship. Kris and Paul Nagle go off early in the stage, dropping plenty of time. The pairing is 15 seconds slower than Dani and loses fifth overall to Petter Solberg. However, Kris is only 5.2 seconds behind the Norwegian. So anything is possible with three stages to go. The stage is set for a thrilling finale in Germany! Special Stage 15: There’s a chance of rain on the opening stage of day 3 at ADAC Rally Germany. Thunder and lightning can be heard and seen in the area around SS15, Drohntal 1. However, the stage itself remains dry for the MINI WRC Team drivers. Kris puts in some promising splits, but then loses a few seconds in the final section due to another puncture. Still, he finishes fifth and is quicker than Dani who loses 6.4 seconds to Hirvonen and concludes the stage in sixth. However, there are no changes in the overall classifications. Dani stays in third, Kris holds fifth.